Remember my post about what I didn't know when it came to sewing with corduroy? Well, I was afraid that I had ruined all chances of making my pants, and I did in a way... But being the creative mind that I am, I fixed my problem! You wanna know my secret? I just sewed my pants with the inside showing instead! Check it out! Not too shabby, huh? Ready for the tutorial? I'm a size 5/6 (leaning more to the 5) so the measurements I give are according to me. Make sure you measure to you. 1. First you have to cut out your material. 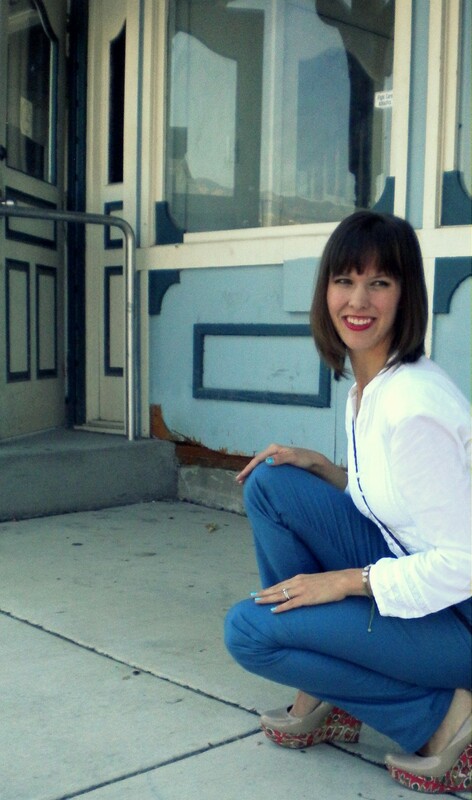 Get a pair of pants that you LOVE and use them for a pattern. Don't worry, you won't be cutting them up! 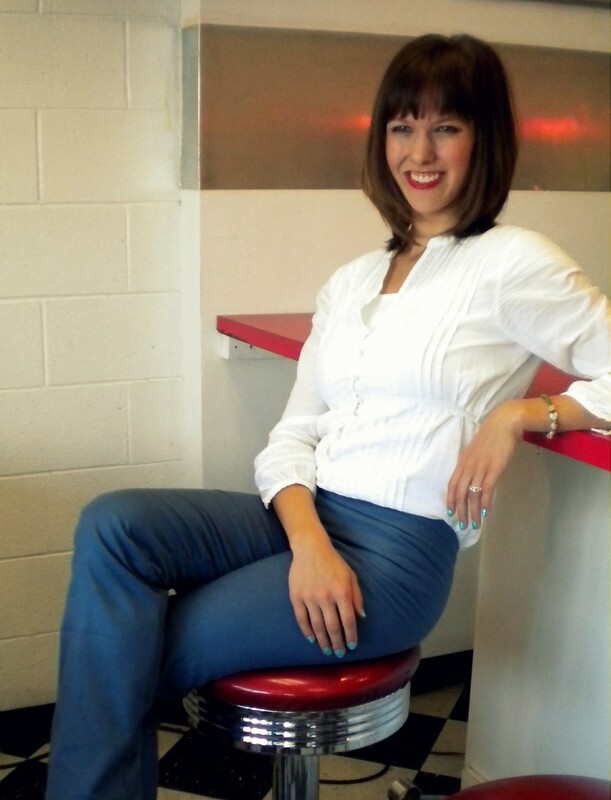 Fold your pants together at the crotch and lay them on your fabric, the outside seam of your pants on the fold. If you want the high waist, put your favorite pair of pants on, and measure from the top of your pants to where you want the waist to be, then add 1 inch. I left 5 inches. Now measure around your waist using a measuring tape however high you want the pants to rise. I was 29 inches (plus 1 for seam allowance). 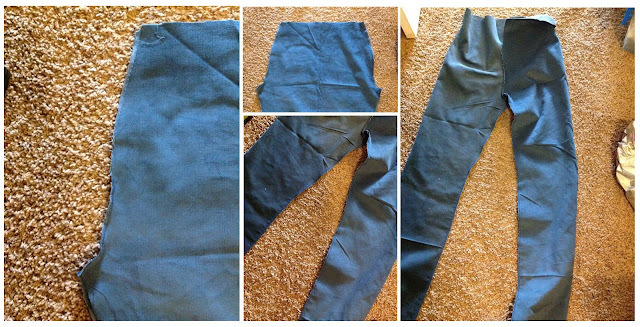 Divide that by 4, and that's how far in you need to go from the fold (because when you're cutting, you're only seeing 1/4 of the pants). So I went in 8 inches (better more material than less!). 2. 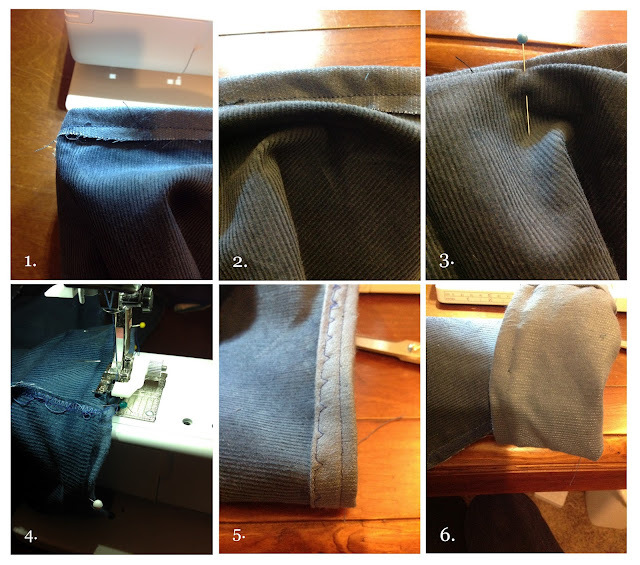 Trace around your pants 1 inch away (for seam allowance). When you get to the knee, (if you're going for the straight leg look) use some sort of straight edge to make sure you're cutting the fabric parallel with the fold. 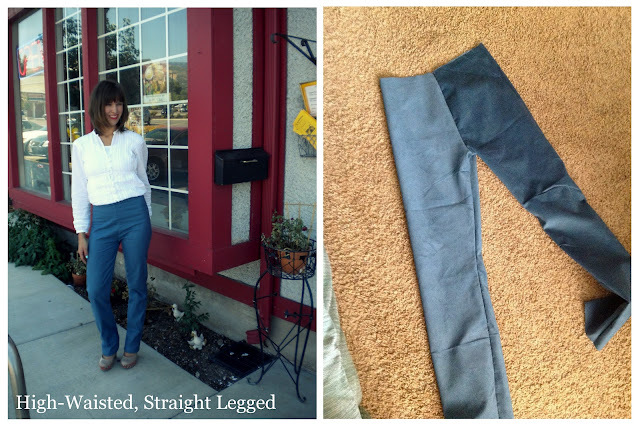 If you want your pant legs long, add a few inches. I added 4 extra inches. Something to keep in mind is your bum. 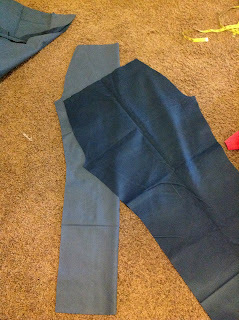 When you're tracing, you're tracing the front of your pants and not the bum because of the way you folded your pattern. If you're using stretchy-ish material, this shouldn't be a problem because it will stretch to fit around your bum. If you don't want it to be too tight, however, consider cutting your fabric further in than 8 inches and then sewing it to fit later. Check that everything looks right annnnd... cut. Transfer this first piece of material down to the next un-cut portion of your bought fabric and cut again so you have two identical pieces. Folded out, your fabric pieces will look like this. 3. Put your two pieces right sides together and pin up the sides where the bum and front are. Sew one side (the bum side) from the top of the pants to where the legs start at 1/2". Sew on the other side from the crotch up just a couple of inches (that's where your zipper will end when it's opened). Make sure you zig-zag stitch as well so that your fabric won't fray. Next, pull your pants open so they look like normal pants. Pin the pant legs to themselves. You are now going to sew the inside seam of the pant legs. 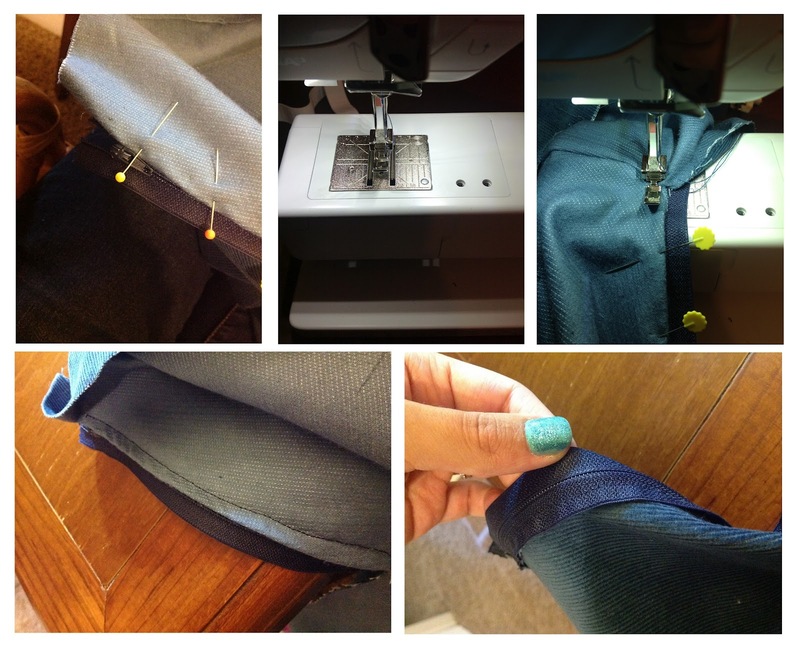 When they are pinned, sew from one pant cuff all the way around the U shape of the pants to the other pant cuff. 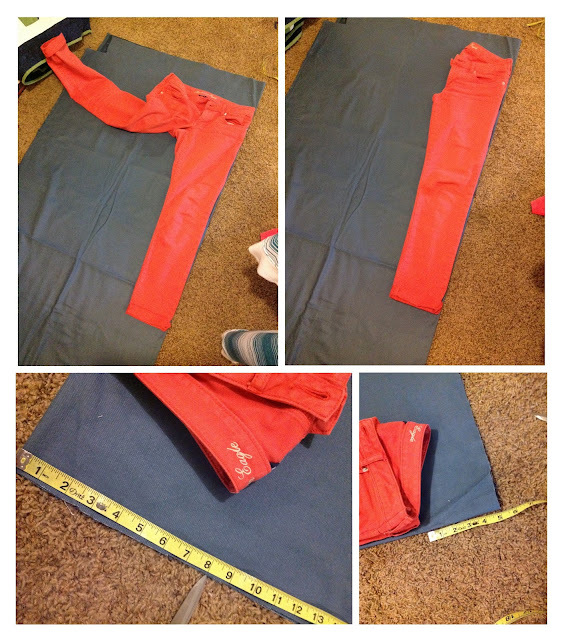 Now you just have to add the zipper, hem the bottom of the pants, and then the top! 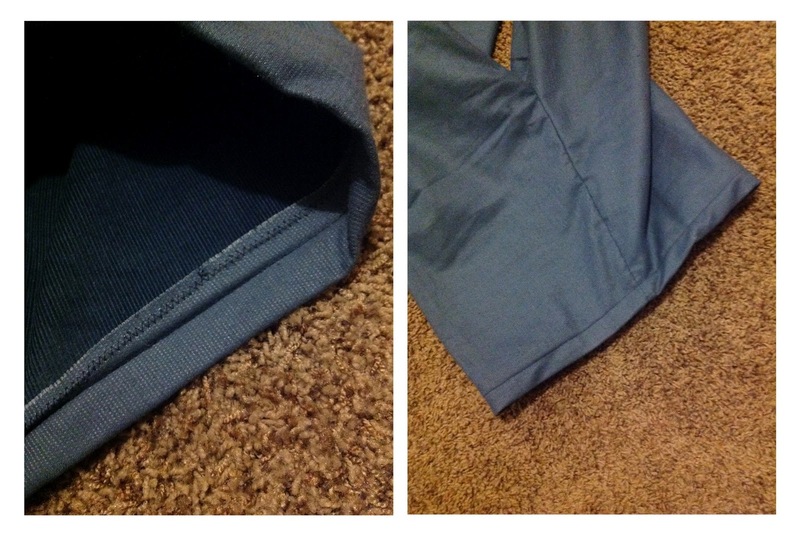 First: Do a regular hem (fold over 1/2" and stitch at 1/4"). Second: Fold up material from pant leg. Third: Pin when the fold is 1/4" away from edge. Fourth: Attach Blind hem foot to machine, situate the needle all the way to the side, align the foot divider with the fold from the pant leg, and stitch with the blind hem stitch. 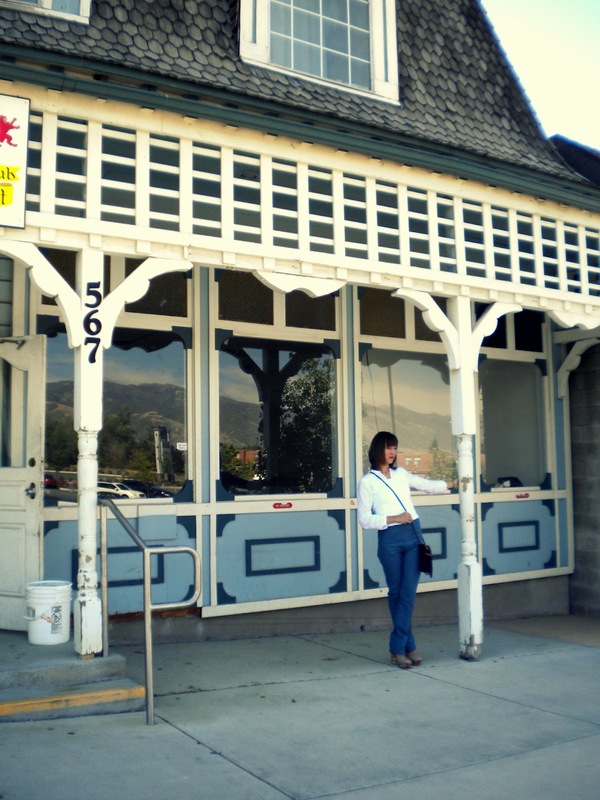 Fifth: This is what it looks like from the inside. Sixth this is what it looks like from the outside. If you do a REALLY good job, you can't even see the tiny bit of thread that caught the material from the pant leg. The video that I linked to will probably help, too. 5. The zipper is a little tricky, but you can do it! 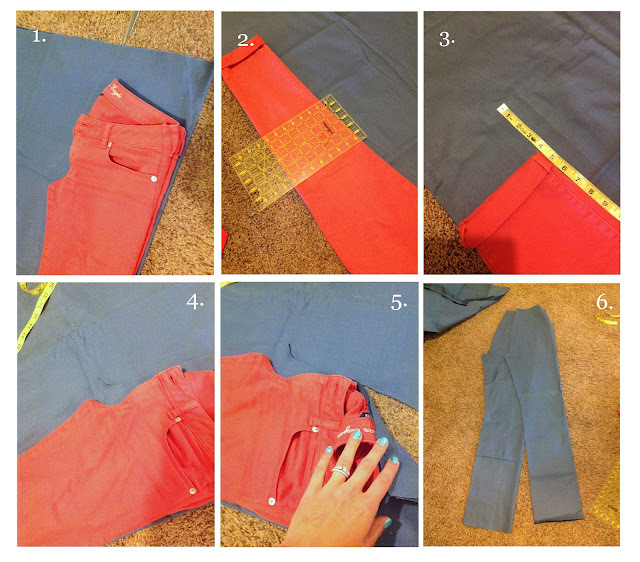 Pin your zipper to your pants while looking at your pants from the outside. Remember that the tabs (the part of the zipper that doesn't have a "zip" on it) are going to be folded down when you hem the waist, so pin it where when you fold your waist down it will end up being where you want the waist to be! Fold the open part of your material under, attach your zipper foot, move your needle all the way to the side (the one closer to the zipper), and then stitch on the outside and go down all the way until you reach the last sewn part of your crotch. Do the same thing on the other side of the zipper. 6. For the waist, you can either do a regular hem (zig-zag stitching, then folding over, or folding over twice), or you can do another blind hem stitch. Whichever you like best (I just did a regular hem). 7. Try the pants on and make any size adjustments you need. If they're a little too big, just take them in by sewing a 1/4" (or whatever) in on the legs, waist, etc. And there you have it! 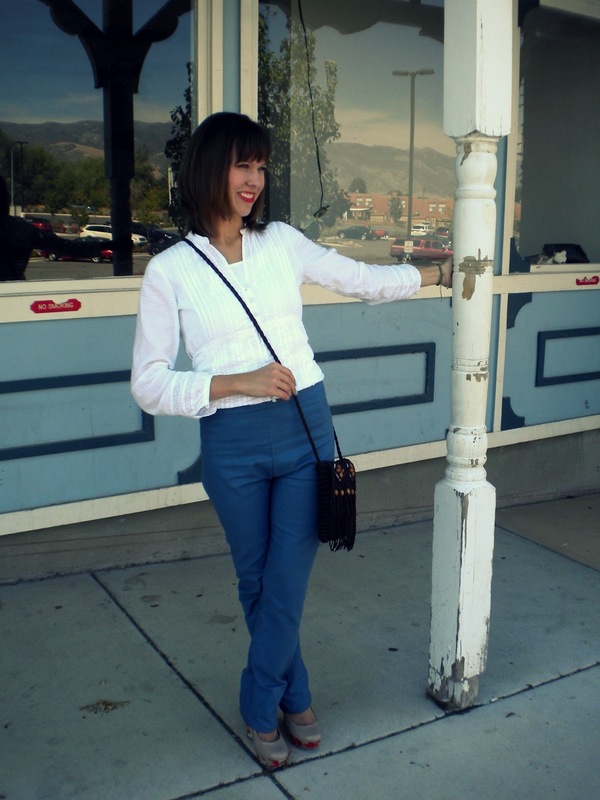 Your very own high-waisted, straight legged pants! I learned a lot from making these pants, especially about sewing zippers and blind hems, but it was SEW worth it! Maybe next time I'll make a 70s-ish shirt to go with it! You are adorable! So talented! I think high waist-ed pants look good on some people but not on others. You for example look great! I would look ridiculous! Love your blog! The nice thing about making clothes for yourself is that you can adjust it until it DOES look good on you! You're so talented!! I think they're hot! Andrew's lucky to have you!! Wish I could sew like you! I know!! I need a sewing machine ASAP! Any suggestions on a starter one? I am most def. a Bernina fan. My family has been sewing with them for at least 15 or 16 years and I don't think ANY of us has had a problem. I guess they're kind of pricey, but in my opinion, when it comes to sewing machines, you need to get quality and they will last you a looooong time. I have the B 330 and I love it! Anyway, that's how I feel about it! Let me know if you get one! Tee hee hee! Love it! Aw! Thanks everyone! You are all so sweet! How am I going to pick? !